Keep your driveways and sidewalks safe with our fast-acting, professional-grade ice melters. We carry a wide range of ice melting products to fulfill your commercial and industrial needs, including environmentally friendly and odorless, as well as convenient spreaders that will save you time and hassles. Contains a higher amount of calcium chloride than any other blend on the market! ComboTherm combines its melting power into each chip. A portion of the chips contain a green performance indicator to prevent wasteful over-application. As the snow and ice melt, the color fades, showing how quickly ComboTherm works. An economical alternative to other ice melters. Its unique composition, a blend of calcium chloride, sodium chloride and potassium chloride, is better at melting ice, as well as being a better value than most blends, which are primarily composed of rock salt. The most value for your money. Get more calcium chloride (over 70%) than any of the competition's blended products. A cost-effective, high performance way to improve safety by melting ice and snow from sidewalks, driveways, and parking lots. Available in both pellets and flake! Safe for use around animals and humans. Safe for use around vegetation. Less corrosive than other chlorides. Won't leave a powdery residue. Fast Acting - Starts working immediately after being applied. Low Melting Temperature - Melts at below-zero temperatures. Safe on Vegetation - Will not harm vegetation when used as directed. Safe on Concrete - Will not harm good, quality concrete when used as directed. Cost-Effective - Blend of four most commonly used deicing chemicals - melting effectively at an economical price. Calcium Chloride - Its unique exothermic reaction gives off heat and starts the melting process even at below-zero temperatures. Potassium Chloride - Helps melt ice while promoting strong root development of your valuable vegetation. Urea - With its fertilizing properties, melts snow and ice while helping your grass and shrubs stay greener. Sodium Chloride - Used for its cost-effectiveness and traditional melting action. An economical blend which contains potassium chloride and sodium chloride that work together to effectively melt snow and ice. Tiger melt is also less harmful to vegetation than many other low cost blends because of the substantial amount of potassium chloride it contains. Keep your driveways, steps, sidewalks, parking lots, and more safe with this high quality calcium chloride blended snow and ice melting product. Melts snow and ice down to 0°F (-18°C). Melts snow and ice faster than rock salt, potassium chloride, or urea blends of similar products. Easy to apply - comes in a convenient wide mouth shaker jug with multi-pour option lid. Available in white or with blue color indicator. A blend of calcium chloride and sodium chloride. Works in Extreme Cold - Melts snow & ice down as low as -15° F.
Penetrating Action - Bores through snow & ice to break its bond with pavement. Melts Quicker - Begins melting faster than rock salt. Efficient - Melts snow & ice more efficiently than rock salt. America's #1 Selling Pet Care Ice Melt! Developed with veterinarians to be safer for pets, people, plants, and surfaces. Formulated without salt or other chlorides that can irritate pet's paws and stomachs. Provides visibility during use with colored pellets. Melts ice & snow below 15°F. Penetrates snow and ice creating a safer environment. When used as directed, EVCO Snow & Ice Melting Salt is safe for use on walks, driveways, porches, steps, parking lots and more. An economical way to adequately melt snow and ice while providing traction to avoid accidents. Bores through ice and snow. 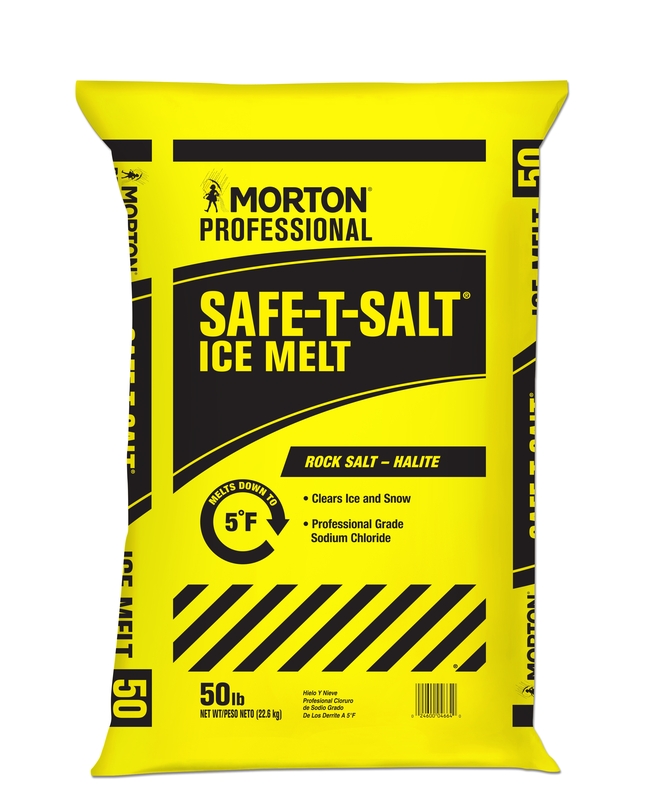 The melting capacity of Morton Safe-T-Salt Rock Salt is effective to -6° Fahrenheit. Rate calculation matrix to establish correct setting rate for any product. 10" pneumatic stud type tires. Fully assembled with a folding handle. Powder coated steel frame with stainless steel fasteners. Polypro 3350 cu. in. hopper. Heavy duty commercial gear box. Sifter-screen catch clumps or foreign materials before clogging agitator.